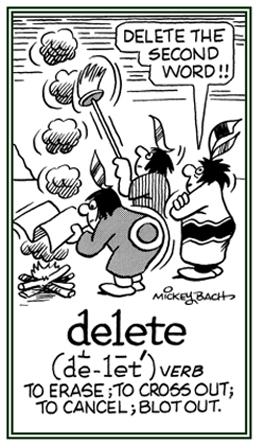 To delete; especially, from typeset matter. 3. Something erased, scored out, or removed from a text or a computer file or directory. 4. In genetics, the loss or absence of part of a chromosome, ranging from a pair of chemicals based pair to a whole chromosomal arm. Of such a nature that anything may be erased from it; such as, paper. Adapted to destroy, to obliterate, or to wipe out. 1. Impossible to remove, to erase, or to wash away; permanent; such as, indelible ink. 2. Making a mark not easily erased or washed away: "Mother used an indelible pen for labeling our clothing." 3. Unable to be forgotten; memorable: "Up until he was 95, my father had an indelible memory." Relating to indelible memories or actions which are impossible to forget, or to have a permanent influence or effect on others.